Preheat oven to 425° F. Cover 10x15 shallow pan with foil, then spray with cooking oil. Wash chicken breasts and pat dry with paper towel. Rinse chicken under cold water, then pat dry with paper towel. Place cereal in zippered plastic bag and crush with your hands until pieces are small. Add fresh herbs, paprika, garlic powder and seasoned salt to cereal, and toss mixture gently to distribute seasonings. Place in a large bowl. In a separate bowl, add melted butter, egg whites and milk. Whisk until thoroughly mixed. 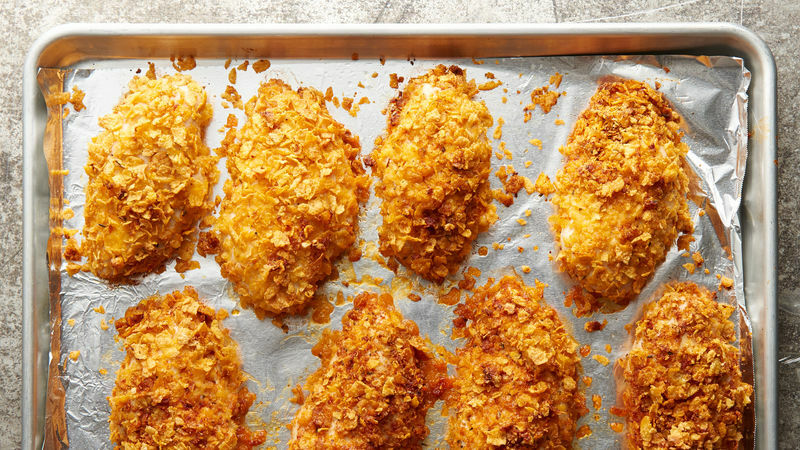 For each chicken breast, dip in butter mixture and then roll in cereal mixture. Double dip in each for better coverage and extra crunch. Place on large shallow pan that is covered in foil and coated with cooking spray. Repeat until all 8 chicken breasts are done. Bake in a preheated oven at 350° F for 45 to 60 minutes. If coating starts getting too dark, cover with foil until final 5 minutes of baking. Remove from pan to a serving platter and serve immediately.